"Les arts décoratifs" There are 28 jewelry. 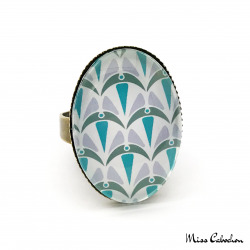 Oval ring with original Art Deco patterns: Curved glass cabochon. Adjustable ring and adjustable to all fingers. Pattern designed by Miss Cabochon. Free shipping! 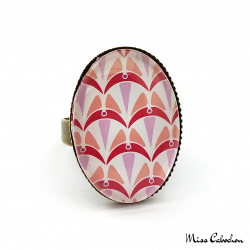 Ring with original Art Deco patterns: Curved glass cabochon. Adjustable ring and adjustable to all fingers. 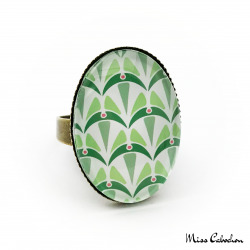 Pattern designed by Miss Cabochon. Free shipping! 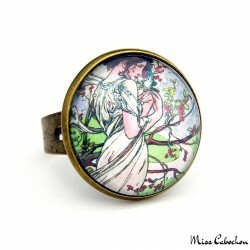 Early 20th century style ring "January by Alfons Mucha": Curved glass cabochon. Adjustable ring and adjustable to all fingers. Free shipping! 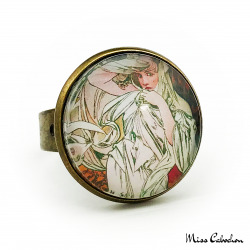 Roaring Twenties style ring "February by Alfons Mucha": Curved glass cabochon. Adjustable ring and adjustable to all fingers. Free shipping! 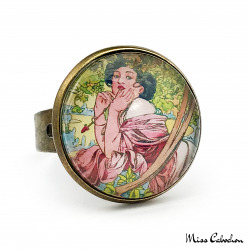 Antique style ring "March by Alfons Mucha"
Antique style ring "March by Alfons Mucha": Curved glass cabochon. Adjustable ring and adjustable to all fingers. Free shipping! 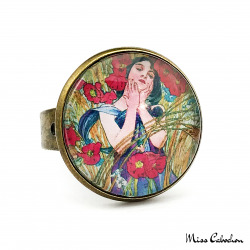 1920s style ring "April by Alfons Mucha": Curved glass cabochon. Adjustable ring and adjustable to all fingers. Free shipping! 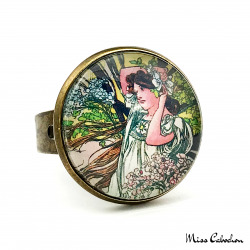 1900s style jewelry "May by Alfons Mucha"
1900s style jewelry "May by Alfons Mucha": Curved glass cabochon. Adjustable ring and adjustable to all fingers. Each copy may be slightly different from the picture. Free shipping! 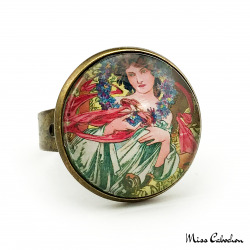 1900s style ring "June by Alfons Mucha"
1900s style ring "June by Alfons Mucha": Curved glass cabochon. Adjustable ring and adjustable to all fingers. Free shipping! 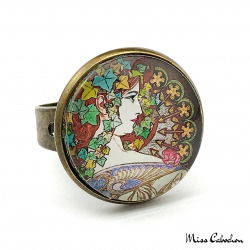 1920s style jewelry "July by Alfons Mucha"
1920s style jewelry "July by Alfons Mucha": Curved glass cabochon. Adjustable ring and adjustable to all fingers. Free shipping! 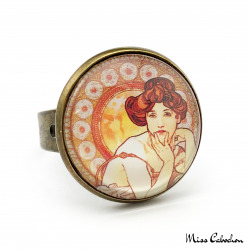 Antique style jewelry "August by Alfons Mucha": Curved glass cabochon. Adjustable ring and adjustable to all fingers. Free shipping! 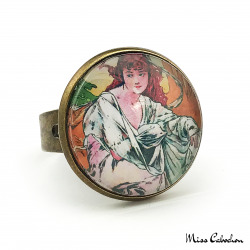 1900s style ring "September by Alfons Mucha": Curved glass cabochon. Adjustable ring and adjustable to all fingers. Free shipping! 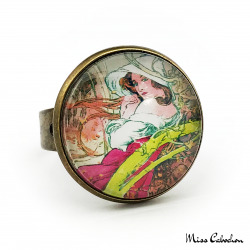 Retro ring "October by Alfons Mucha"
Retro ring "October by Alfons Mucha": Curved glass cabochon. Adjustable ring and adjustable to all fingers. Free shipping! 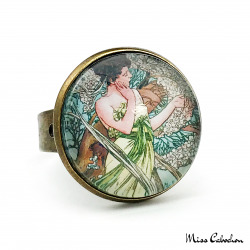 Art nouveau ring "November by Alfons Mucha"
Art deco nouveau "November by Alfons Mucha": Curved glass cabochon. Adjustable ring and adjustable to all fingers. Free shipping! 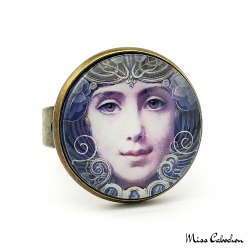 Art deco ring "December by Alfons Mucha": Curved glass cabochon. Adjustable ring and adjustable to all fingers. Free shipping! 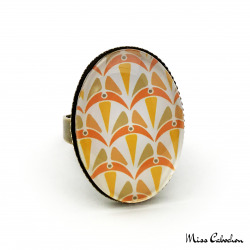 Oval ring with original Art Deco patterns: Curved glass cabochon. Adjustable ring and adjustable to all fingers. Pattern created by Miss Cabochon. Free shipping! Ring with original Art Deco patterns: Curved glass cabochon. Adjustable ring and adjustable to all fingers. Pattern created by Miss Cabochon. Free shipping! 1910s style ring: Curved glass cabochon. Adjustable ring and adjustable to all fingers. Free shipping! 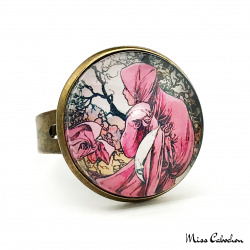 The background of this ring includes a part of the illustration "Fächer auf goldenem Grund" created in 1901 by the painter Louis Welden Hawkins. 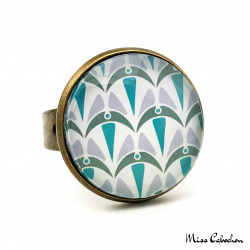 Art deco ring: Curved glass cabochon. Adjustable ring and adjustable to all fingers. Free shipping! 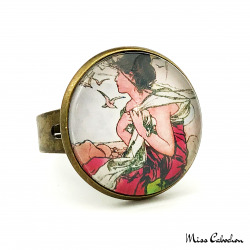 The background of this ring includes a part of the illustration "Laurel" created in 1901 by the painter Alfons Mucha. 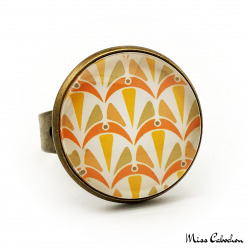 Art deco ring: Curved glass cabochon. Adjustable ring and adjustable to all fingers. Free shipping! 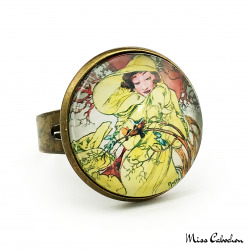 The background of this ring includes a part of the illustration "Topaz" created in 1900 by the painter Alfons Mucha. 1900 style ring "Amethyst": Curved glass cabochon. Adjustable ring and adjustable to all fingers. Free shipping! 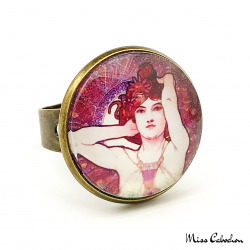 The background of this ring includes a part of the illustration "Amethyst" (The Precious stones) created in 1900 by the painter Alfons Mucha.